The Awful Revolution: Is Neoliberalism a Public Health Risk? Myers, D.G., & Diener, E. (1995). Who is happy? Psychological Science, 6, 10-19. p 13. Reprinted with APA permission. Neoliberal advocates are correct in asserting that a sense of freedom increases subjective well-being; they are wrong in assuming that neoliberal policies maximize perceived freedom.15 Neoliberal policies increase inequality which decreases perceived freedom and is associated with a host of social ills (detailed below). Further, nations possessing the highest life satisfaction—Denmark, Netherlands, Norway, and Switzerland—are all more egalitarian and collectivist than the United States.16 This is consistent with research demonstrating that more generous welfare state policies are associated with higher levels of happiness.17 There are a couple of reasons that relatively collectivist countries with generous welfare policies tend to be happier than the U.S. First, in a hyper-individualistic, competitive social milieu, income becomes a salient social desideratum causing individuals to overrate its importance in generating well-being and to lose sight of more important factors.18 Second, while people generally prefer choice, there is evidence that too much choice is deleterious to well-being. This phenomenon has been given the felicitous label the paradox of choice.19 For an example of the paradox of choice, think of your last trip to the supermarket. Were you overwhelmed by the sundry toothpastes? What is the difference between advanced vivid fluoride and iso-active fluoride? Should you use fluoride or peroxide or baking soda or all three? The paradox of choice occurs because we wish to make rational choices but have limited time and resources. It is often impossible to gather sufficient information for optimal choice. Thus, we are glutted by consumer goods that do little to increase happiness and much to increase anxiety. To the extent that neoliberalism promotes consumerism, it is likely to decrease subjective feelings of well-being. References 23-27. Note: Ý = indicator increases with greater inequality. ß = indicator decreases. A quick glance at the table reveals that inequality is associated with lower overall population health and mental health as well as a host of social ills. Even social mobility, the cause célèbre of neoliberal aficionados, is negatively correlated with inequality (i.e., the more equal the society, the greater the social mobility). 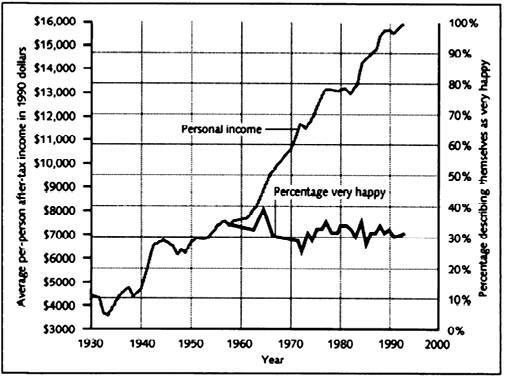 These data further help to understand the lack of a relationship between per capita income and happiness: It is not the income that matters so much as its relative distribution. We’re the middle children of history… no purpose or place. We have no Great War, no Great Depression. Our great war is a spiritual war. Our great depression is our lives. In the past, all we could rely on to provide evidence about generational trends were animadversions cast on the younger from the armchair of the older. Of course, these do not qualify as unbiased testimonials. 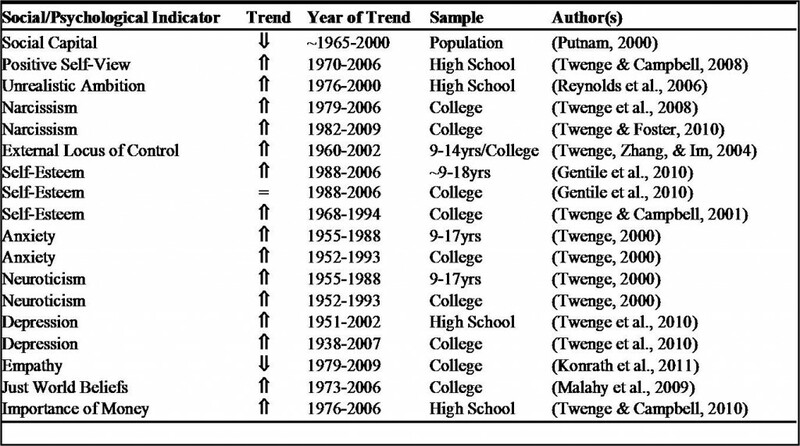 Fortunately, in recent years, Jean Twenge and her colleagues have pioneered the use of cross-temporal methods to assess generational trends rigorously and objectively.30,31 The gist of this method is to collect scores on surveys as far as back the data allow. For example, we might collect college students’ scores on a scale measuring self-esteem from 1976 to the present. We can then take the average score of college freshmen from 1976 and compare them with the college freshmen of 1977 and so on up to the most recently published data. The brilliance of this method is that we can perform all sorts of statistical analyses comparing cohorts of college students and we can quantify cohort trends. It may be a bit more challenging than pontificating anecdotally, but it does have the distinct advantage of scientific soundness. References 32-44. Note: Ý = indicator increased over period listed in ‘Year of Trend’. ß = indicator decreased. Sample refers to the age of the cohort studied. There has been a decline in social capital since the middle of the 1960s across all age groups. This is manifest in everything from decreased voter turnout to less frequent conversations with neighbors. Within young cohorts there is a trend toward individualistic narcissism as indicated by cross-temporal increases in positive self-view, self-esteem, and narcissistic personality. That is, the youth of today score much higher on scales measuring these than did youth 10 or 20 years ago. While high self-esteem is generally desirable, it is not when it becomes unhinged from external accomplishment. When this occurs, as it currently has, it leads to irrational ambition, competitiveness, defensiveness, and narcissism. The same applies, a fortiori, to positive self-views. Of course, it is desirable to view yourself in a positive light. However, if you believe you are the most intelligent, attractive, and athletic person in the known world, you are less likely to be cooperative and altruistic. Interestingly, both external locus of control and just world beliefs have risen since the 1970s. External locus of control refers to the belief that it is mostly luck that determines one’s lot in life. Individuals who rate high on external locus of control tend to be cynical as they do not believe their own actions can be efficacious in producing desirable outcomes. Thus, with rising external locus of control, it is likely that sustained activism decreases. Just world belief refers to the inclination to believe that the world is fundamentally just and that people get what they deserve. Individuals who possess just world beliefs tend to justify the status quo and blame others for their failings—even if these are caused by external phenomena (e.g., structural changes in the economy, severe illness). Therefore, youth today are more likely to justify the status quo and blame victims than were youth in the 1970s. 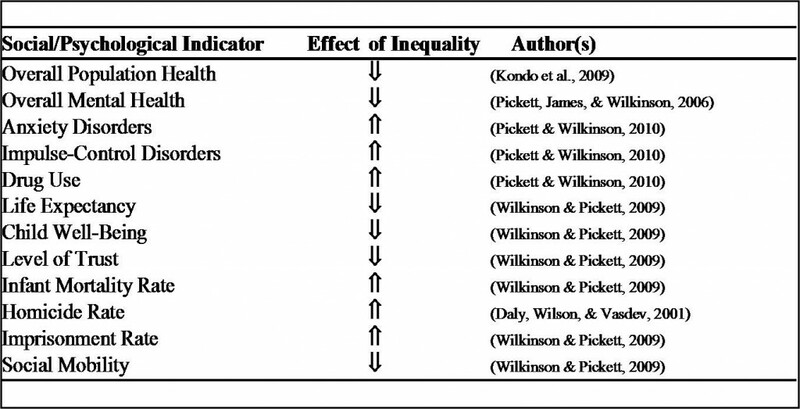 Taken as a whole, the research summarized in the above table is damning for advocates of neoliberalism. Youth today suffer from increased anxiety, depression, and mental illness; exhibit inflated self-views and decreased empathy; believe money is more important than previous generations; and are more likely to accept the status quo with cynical acquiescence. These psychological trends are mirrored by a steady decline in social capital and a rise in crass materialism.45 We must be careful not to blame youth for these trends. They are caused by material and cultural changes, not by changes in innate psychology. These are the outcome of a culture predicated on material values and individualism. In short, these are the predictable results of neoliberal policy. They made a wasteland and called it peace. While we are possessed of no special wisdom to offer activists advice, it is important to keep in mind that neoliberalism is not written in the stars: There are alternatives. Ben Winegard is a graduate student studying evolutionary and developmental psychology at the University of Missouri. He has published peer-reviewed articles on sports fandom and female body dissatisfaction. He also has an interest in radical politics and activism. Ben can be reached at: bmw8vb@mail.missouri.edu. Cortne Jai Winegard has a Master’s Degree in community development and urban planning. She is active in the Columbia, Missouri area promoting simple living and biking. She does not own a motor vehicle and is proud of it. She is also interested in radical politics and activism. Cortne can be reach at: QiQiJai@yahoo.com. Read other articles by Ben Winegard and Cortne Jai Winegard. This article was posted on Tuesday, April 19th, 2011 at 8:02am and is filed under Classism, Health/Medical, Neoliberalism, Psychology/Psychiatry.